The Passumpsic Valley Watershed is located in the Northeast Kingdom of Vermont. From cascading rapids in the north, to peaceful waters flowing through its green valley, the Passumpsic River is one of Vermont’s most treasured resources. Anyone who has cast a line into the waters in search of a fish, taken a swim on a hot summer’s day, or has simply admired the beautiful view, knows the health and well-being of the Passumpsic is worth preserving. According to the Rutland Herald, the Abenaki word Passumpsic means “flowing over a clear sandy bottom”. Remarkably, anyone canoeing, kayaking, tubing or fishing the mainstem of the Passumpsic will find that the Abenaki’s description still holds. According to the Vermont Department of Environmental Conservation, “the Passumpsic River watershed is located in northeastern Vermont and drains 507 square miles, a major portion of Caledonia County and minor portions of Essex, Orleans and Washington counties. 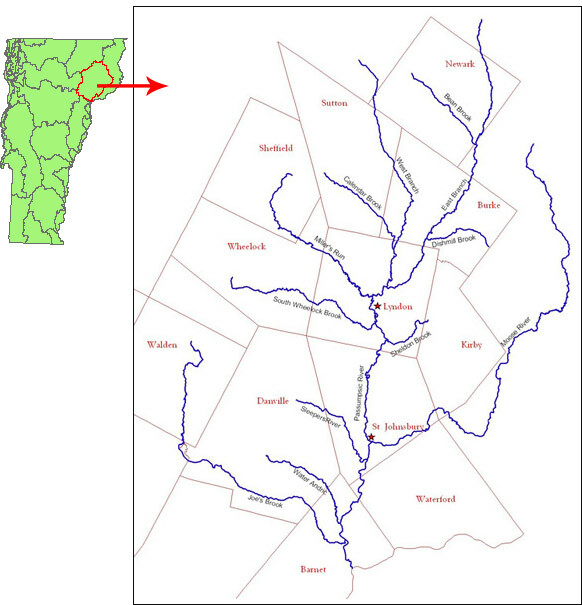 The Passumpsic River mainstem forms where the East Branch and West Branch join just northeast of Lyndonville and flows about 23 miles to the south until it reaches the Connecticut River in East Barnet passing over a series of seven hydroelectric dams along the way. The East Branch originates in the town of Brighton and flows south-southwesterly for about 19 ½ miles draining a 65-square-mile watershed before meeting the West Branch. The West Branch originates from several tributaries in the town of Westmore and flows south-southeasterly for about 14 miles before joining the East Branch. The West Branch drains a 68-square-mile watershed. A more extensive basin description is available in The Passumpsic River Watershed – Water Quality and Aquatic Habitat Assessment Report (VDEC 2009)”.